Multi Ch Gottabe's Spot the Winner and the beautiful Multi Ch producer IABCA CH Bluegrass Calamity Jane from Twin Pines kennels. This was a combined effort by the three of us that laid the foundation of Blackbriar. 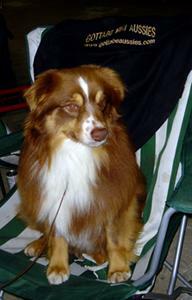 Dragon and his sister Maven, from the beginning far exceeded my expectations in everything I could want in an Aussie! 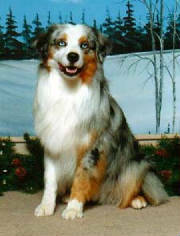 As a puppy he was a laugh a minute and has never lost his exuberance for life and the task at hand. Dragon started his show career totally by accident -- he was going through a stage called "the puppy uglies" having lost most of his baby coat. I had entered his sister and just taken Dragon along for the ride. His sister at first just didn't want to cooperate and not wanting to pressure her too much on her first long road trip (Sac CA to Seattle WA), I scratched her and entered the "nakie pup" for the experience. I was more than pleasantly surprised when he proceeded to take six Best of Breed and Herding Group 1s and 4 of the 6 Best in Shows-- against pups that had won their specialty shows the same day!